Soups can be a nutritious way to start off a meal, helping to fill you up so you eat fewer calories overall during your meal. Unlike most types of liquids, soups are actually as filling as solid foods, according to a study published in "Physiology & Behavior" in January 2005. Although broth-based soups tend to be lower in calories than creamy soups, many versions of lobster bisque, a soup made with a mix of broth and cream, are still low enough in calories to fit into a healthy diet on occasion. 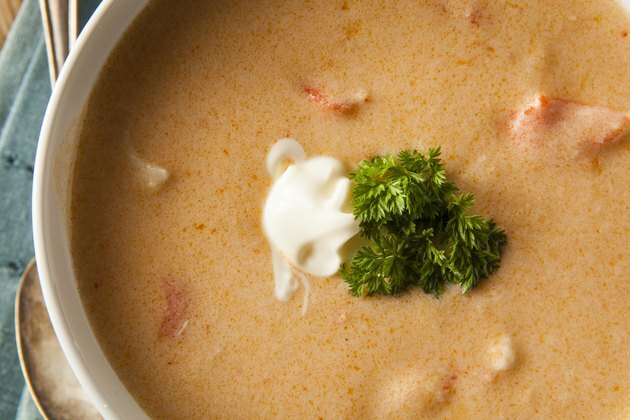 A 1-cup serving of lobster bisque can range in calories from 188 to 470 calories. Restaurant versions tend to be somewhere in the middle, with about 210 to 359 calories. Versions of bisque with a lot of actual lobster meat are higher in calories than those just made with lobster broth. Higher amounts of heavy cream also increase the calorie content. Reducing the amount of cream or using light instead of heavy cream can help you lower the calories in your lobster bisque recipe.